Yet another lovely drive through Montana – we stopped briefly in a gorgeous town named Ennis for lunch before continuing on our journey. Arriving at the parks west gate (Montana) just after noon, it was busy, but still bearable. Entrance to the Park is $35USD for a vehicle and lasts for 7 days. We didn’t have 7 days, but we were determined to make the most of the time we did have. We’d already worked out our route around the park, covering as much as we could. First stop was the incredible Grand Prismatic Spring, the largest hot spring in the United States and the Excelsior Geyser Crater. The colours were out of this world AMAZING! Next up, we headed for the famous Old Faithful geyser which is just a few minutes down the road. 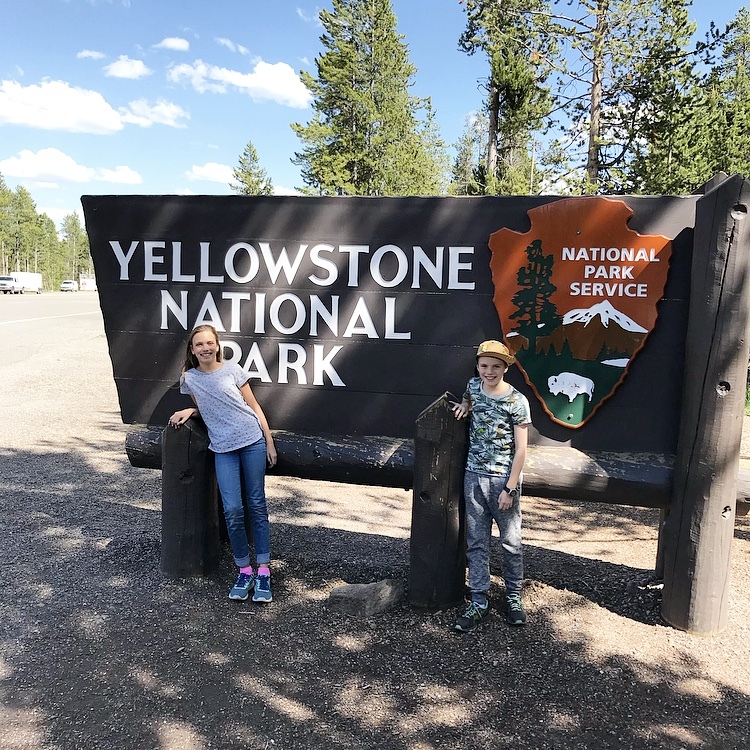 The visitor education centre in front of Old Faithful was so great – the kids loved it. So many interactive games and facts about the geysers. It was the perfect way to kill some time whilst we waited for the clock to tick down, waiting for the next eruption. We got a great seat around Old Faithful, and waited for him to explode. It was brilliant. An incredible sight, seeing boiling water spouting over 100 feet into the air – worth the wait. We were lucky enough to spot a lonesome wolf crossing the mountain, as well as many bison and deer. Our eyes were peeled for bears, but no such luck. We stayed in the park until sunset. Cruising around to the waterfalls, and lakes. It was so pretty. All of it. We had only allowed ourselves a day in the park, and in hindsight, wish we’d allowed longer. Perhaps another day or two to cover more ground and really soak it all in. Our hotel was another 3 hours away in Tetonia, Idaho. The kids were fast asleep in the car and missed the gigantic moose grazing on the side of the road. He was beautiful!!! Next, we make our way down through Idaho, towards Provo, Utah and on from there as we head for the GRAND CANYON!! !